ACCIONA transparently presents the most prominent figures in recent years. With this interactive tool you can generate different types of graphs, selecting the desired date and magnitudes. PALACIO DE FERIAS Y CONGRESOS. MÁLAGA. SPAIN. "The difficulties faced by the Company in recent years have not prevented us from solidifying and confirming our business model, and that encourages us to look to the future with confidence and assurance"
It is my pleasure to present the Annual Report for 2014. As you know, it was a year in which the global economy continued to recover, although not all countries did so at the same pace. The improvement is expected to continue in 2015, although the good prospects for the advanced economies contrast with those for the emerging economies and oil-exporting countries. After being one of the Euro area countries that was most affected by the crisis, Spain’s economy recovered by 1.4% in 2014, the first growth after five years of decline. Elsewhere in Europe, growth was weak and uneven, although the future prospects are good as there are already signs of acceleration, supported by low oil prices and the European Central Bank’s expansive monetary policy. It seems clear that we are emerging from one of the worst economic crises in living memory. The positive economic situation, coupled with ACCIONA’s good results and the significant reduction in its risks as a result of fulfilling the commitments made in our Action Plan, enable us to look to the future with optimism. The presentation of the results for the year 2014 marks the end of a difficult period of sacrifice in which ACCIONA suffered the impact of energy reform in Spain, a period in which we strengthened the group of companies and enhanced our growth potential and our ability to weather other crises that may arise in the future. In this context, a clear sign of the Group’s solid position and of the return to normality is the decision by the Board of Directors to resume dividends; the first will be paid in 2015 out of 2014 profits, subject to approval by the shareholders. The year 2014 was the first in which the effects of Spain’s new regulations were felt for the full twelve months: Royal Decree 413/2014 had a negative impact of 231 million euros before taxes with respect to 2013. If we also factor in the effect of the various legislative reforms in the electricity industry since 2014, the negative impact on the 2014 accounts was 346 million euros before taxes. Last year was marked by intense activity within the Action Plan that commenced in 2013, whose main objective was to reduce ACCIONA’s financial risk and preserve its capacity for action and its growth potential in the face of regulatory changes with a drastic impact on Group profitability. In order to enhance our credit metrics, the adjustment plan focused on selling and rotating mature or non-strategic assets, selling minority stakes in our businesses to financial partners, containing capital expenditure and operating costs, and eliminating the dividend out of 2013 earnings. In the last two years, the plan to divest non-strategic assets raised close to 1 billion euros, and we entered into alliances — such as the one with KKR — which enable us to accelerate growth in international projects, as well as establish a strategic relationship not only in the Energy division but also in other areas of common interest. Apart from significantly improving Group leverage, in 2014 we also implemented a policy of diversifying the parent company’s funding sources so as to enhance our financial profile. Our exposure to bank debt was reduced from 77% to 25% of total debt with recourse in 2014, and the average term of the debt was extended from 1.35 to 2.44 years. We recently announced a 1,800 million euros syndicated deal (a loan of 360 million euros and a credit line of 1,440 million euros) that matures in five years and culminates the process of transforming the debt structure. 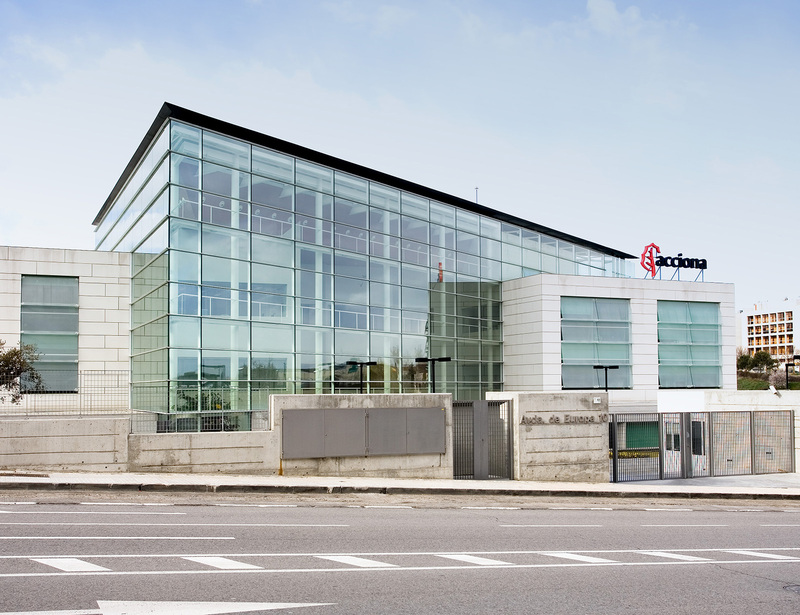 ACCIONA’s turnover in 2014 amounted to 6,499 million euros, 3.6% more than in 2013, EBITDA to 1,087 million euros (up 2.4% on 2013) and attributable net profit to 185 million euros, contrasting with the loss of 1,972 million euros reported in 2013. 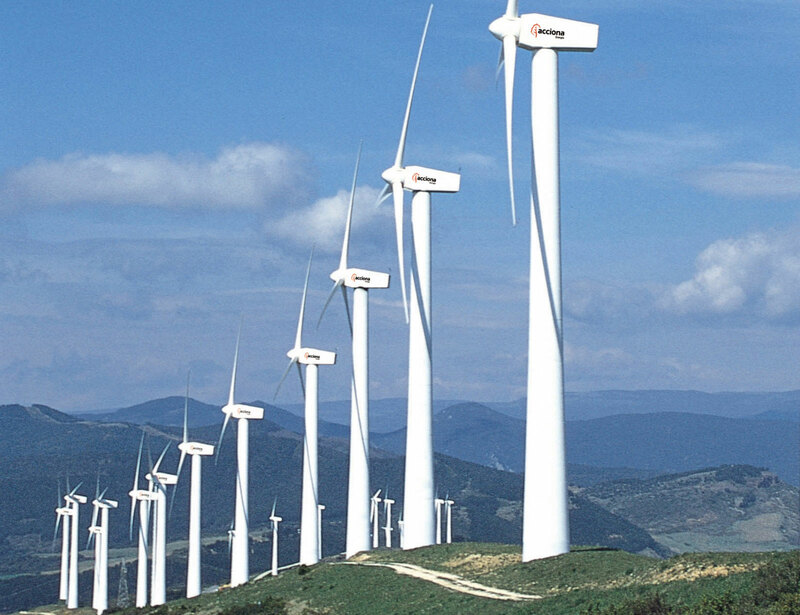 ACCIONA Energy contributed 73% of Group EBITDA, a total of 788 million euros. But for the negative impact of regulatory changes, the division’s EBITDA would have increased by 4.7%. Our wind turbine manufacturing business experienced a radical turnaround, culminating the transformation process with major successes on the commercial and financial fronts, and it has a promising future due to the order book and the competitiveness of its product line in international markets. 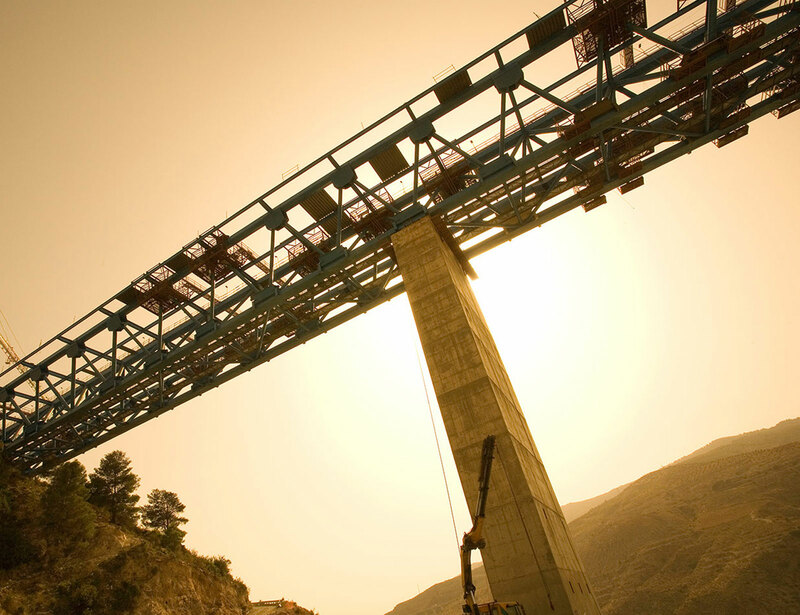 The new Infrastructure division, restructured to encompass the Construction, Water and Service businesses, expanded EBITDA by 43.4% o 173 million euros. 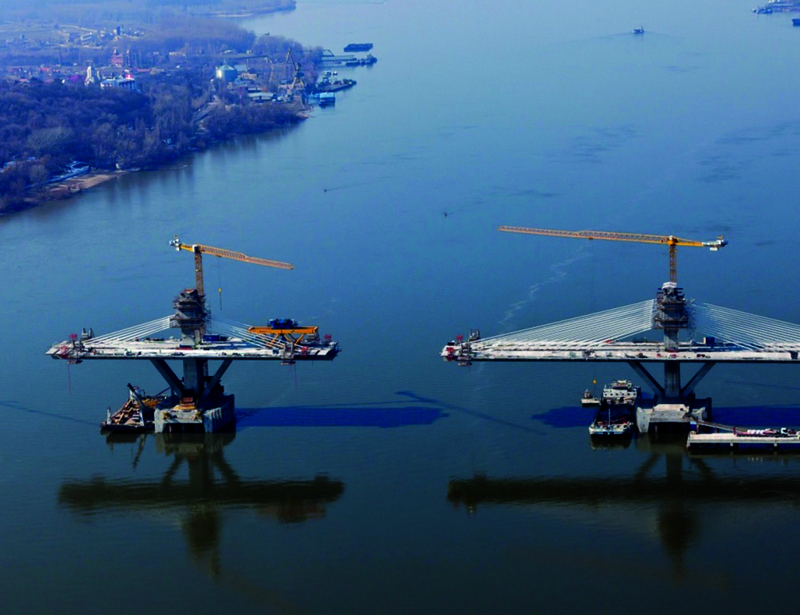 The improvement in the international construction business made a strong contribution to that growth, and this area accounted for 64% of the backlog in 2014, compared with 54% in 2013, enabling the Construction division to attain 118 million euros in EBITDA, double the previous year’s figure. Our Water business obtained 35 million euros in EBITDA on 409 million euros in revenues; the latter figure was lower than in 2013 because of the completion of the main construction projects that were under way in that year. 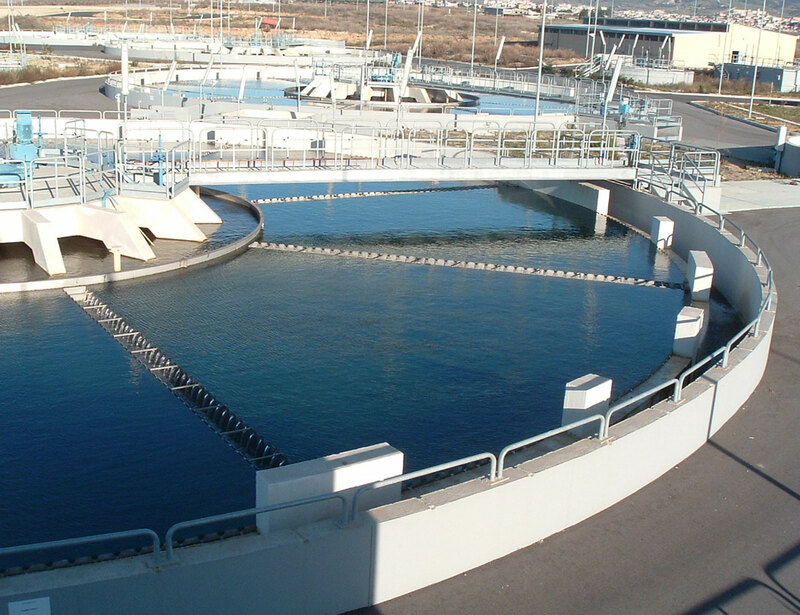 The Water backlog amounted to 9,358 million euros at 2014 year-end. 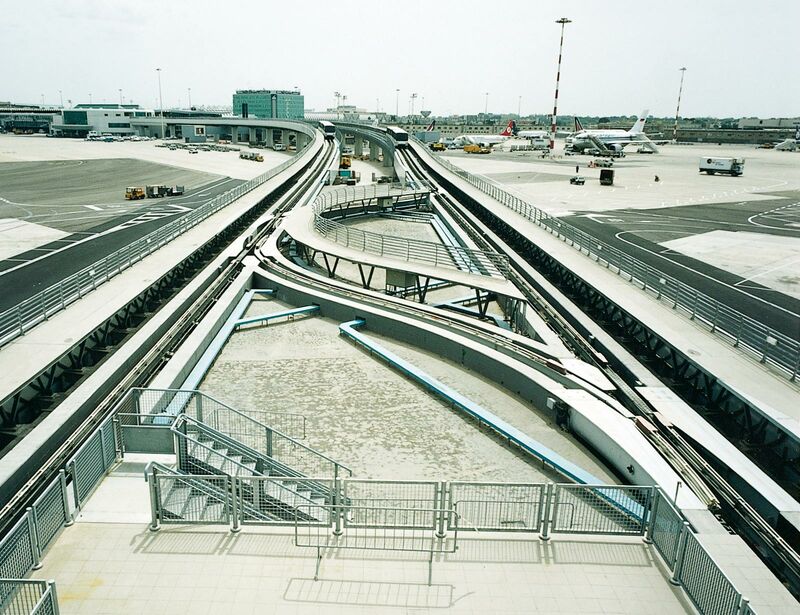 Within the Infrastructure division, the Service area reported 21 million euros in EBITDA, i.e. unchanged with respect to the preceding year. The Group’s other activities made a considerable contribution to improving ACCIONA’s earnings, with a 44% increase in EBITDA to 126 million euros due to good performance by Trasmediterranea, the Real Estate business and Bestinver. Specifically with regard to Bestinver, I would like to mention the change in management in the second half of 2014. Although this had an undeniable impact on the amount of funds under management, its strong brand, client loyalty, and the good performance and commitment of the new team inspire confidence and optimism with regard to future performance. Bestinver successfully weathered the transition, has the necessary stability and enjoys the Group’s full support; accordingly, it continues to be a source of value for its clients and for ACCIONA, as evidenced by the results achieved since the change in management. As a result of the Action Plan, ordinary net capital expenditure slowed to 340 million euros, the same level as 2013, including most notably 282 million euros invested by ACCIONA Energy and 70 million euros by Infrastructure. Net interest-bearing debt declined significantly, from 6,040 million euros in December 2013 to 5,294 million euros at the end of 2014, which reduced the net debt/EBITDA ratio from 5.7 to 4.9. Fulfilling our commitment to accountability to our shareholders and stakeholders that goes beyond economic information, this year we will present our fourth Sustainability Report for approval by the upcoming Shareholders’ Meeting. With regard to sustainability, I would emphasize that we cut CO2 emissions by 8% last year, reaching 16.3 million metric tons of emissions avoided; we concluded the ambitious and pioneering project to calculate the greenhouse gas emissions associated with the activity of our more than 28,000 suppliers; and we increased investment in environment-related businesses by 8.1% to 560 million euros. As for community outreach, the ACCIONA Microenergy Foundation continues to help over 21,000 people with low income in Peru and Mexico. ACCIONA is firmly convinced that carbon pricing is essential in order to make progress towards a low carbon economy. Consequently, in partnership with major companies from all sectors and with international public institutions, we are leading an effort to achieve an effective commitment from governments at the forthcoming COP21 climate summit in Paris. In this connection, as strategic partners of the World Economic Forum, we are members of the CEO Climate Leadership Group, which is advocating an ambitious agreement in Paris. We also work with alliances such as We Mean Business and the Low Carbon Technology Partnerships Initiative. We work with the World Bank in the Carbon Pricing Leadership Coalition, and we are aligned with the Business Leadership Criteria on Carbon Pricing; both are initiatives to promote an agreement on carbon pricing at the COP21 Conference of the Parties in Paris. But we are going even farther. ACCIONA has begun to incorporate the price of CO2 into its investment decisions voluntarily, in anticipation of what we trust will become a reality in the near future. All of these sustainability-related actions have been recognised by the leading international monitoring organisations. In 2014, we were included in the Dow Jones Sustainability Index for the eighth year. 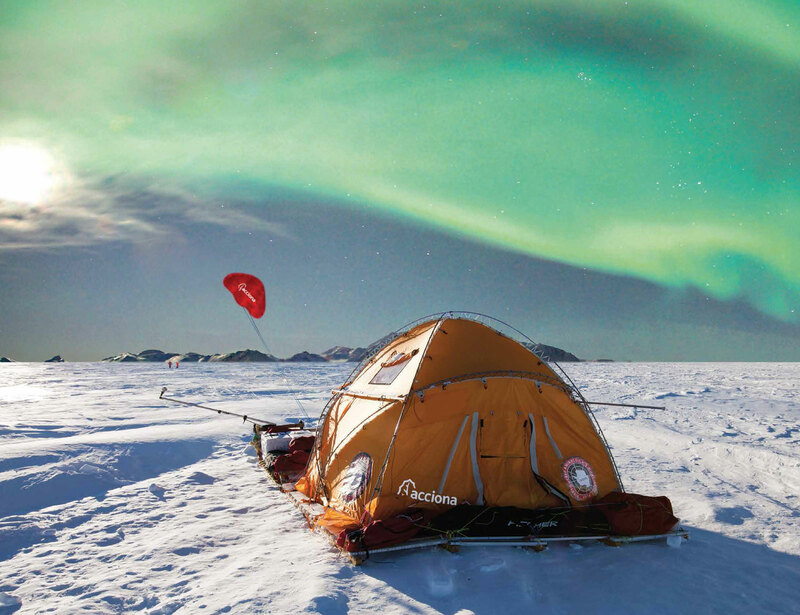 We are also present in other leading sustainability indices, including FTSE4Good, MSCI Global Climate Index, CDP Climate Performance Leadership Index and CDP Climate Disclosure Leadership Index, and we are also members of the leading organisations in the area of sustainability, climate change and corporate responsibility. Within the United Nations, we are members of Secretary-General Ban Ki Moon’s Advisory Board in the Sustainable Energy for All initiative, where we are also co-chairs, with Irena, the International Renewable Energy Agency; alongside Irena, we are also involved in the Global Coalition for Action project, which aims to enhance the perception of renewable energy worldwide. We are members of the Management Committees of the Global Compact Lead and Caring for Climate, both of which are UN initiatives. We are also members of the Executive Committee of the World Business Council for Sustainable Development, where we lead the Scaling up Renewables in the Electricity Sector initiative. We are members of the Corporate Leaders Group on Climate Change and the Green Growth Group, which connects European Environment and Energy Ministers with the private sector in pursuit of more ambitious measures to combat climate change. 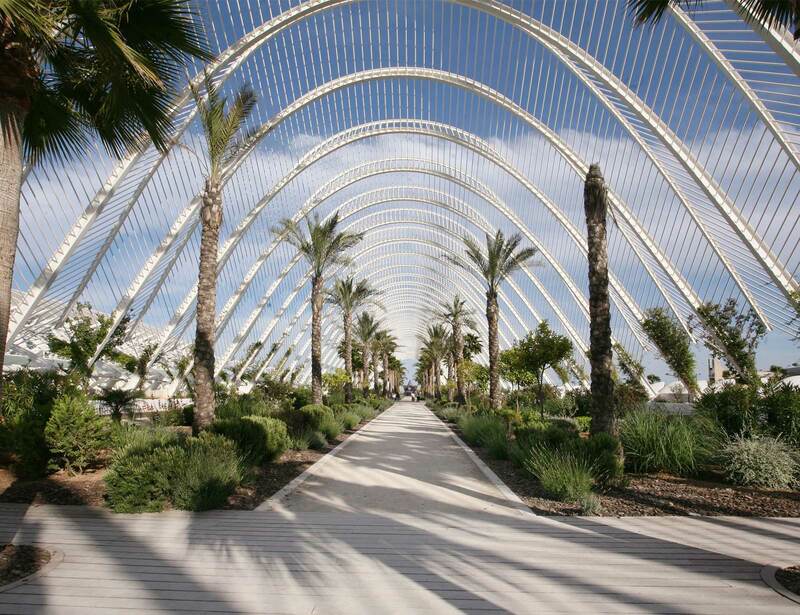 We are also members of the recently created Spanish Green Growth Group, which supports a decarbonised economy and other measures to seize Spain’s potential to create a green economy. The difficulties faced by the Company in recent years have not prevented us from solidifying and confirming our business model, and that encourages us to look to the future with confidence and assurance. The Company will continue to take the long view in order to create sustainable value for ACCIONA, for shareholders and for society as a whole. The world needs investment in infrastructure and energy, which are very capital intensive. Constant population growth and the consequent need for urban development require investments amounting to 57 trillion dollars in infrastructure by 2030 (McKinsey Global Institute) and 7.4 trillion dollars in energy by 2040 (World Energy Outlook, IEA 2014). Consequently, we face a sizeable need for investment in our core businesses; thanks to our competitive advantages and lower cost of capital, we are well positioned in a growth niche in order to face the future and contribute to our society’s economic and social development. To conclude, I am optimistic and I am convinced that ACCIONA has returned to normal and will be able to seize market opportunities and strengthen its positioning in order to grow, create value and help respond to the great challenges facing our society. ACCIONA's priority is to meet current needs without compromising those of future generations. The Company's mission is to hold a position of leadership in the creation, promotion and management of infrastructures (construction, industrial, water and service) and Energy, actively contributing to social welfare, sustainable development and creating added value for stakeholders. Our vision is to be able to respond to the challenge of achieving sustainable development through all our areas of activity, so that current and future generations will enjoy a better life. One of the main milestones in the year was the partnership with KKR. The strategic goal of the alliance is basically to strengthen and enhance ourcapacity for growth in renewable energies worldwide. ACCIONA has reorganised the Infrastructure division, which now includesthe construction, engineering, water and service businesses. The Energy division has reduced capital expenditure and operating costs and has completed an extensive transformation of ACCIONA Windpower. The measures in the Action Plan aimed at strengthening the group's credit profile led to a sharp reduction in group net debt and in the netfinancial debt/EBITDA ratio. In this section you can find the organisational chart for the company's management team. 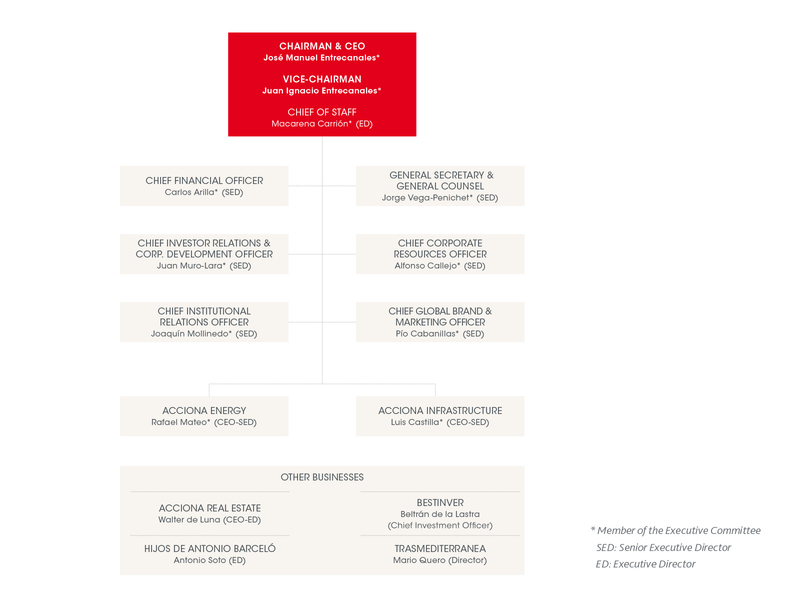 A graphical representation depicting ACCIONA's management structure and its various business lines. 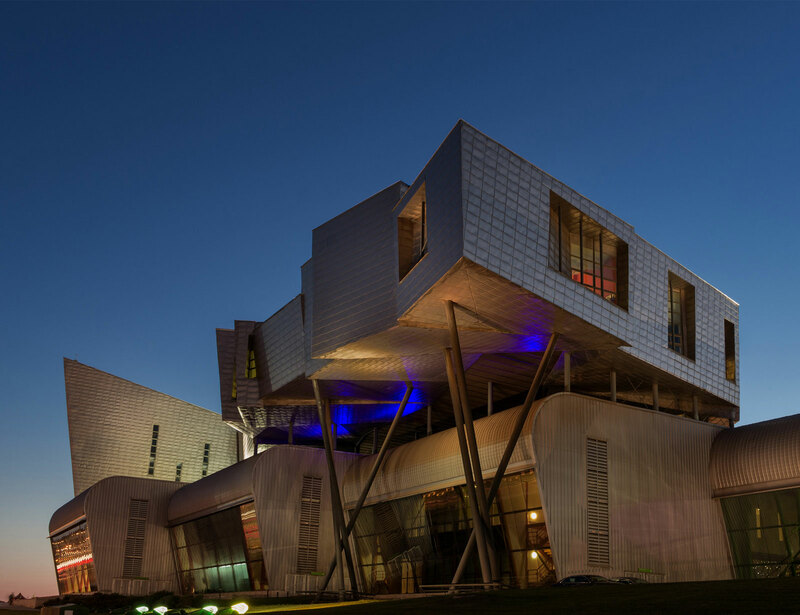 A strong and multidisciplinary management team, comprised of leaders with extensive international experience. 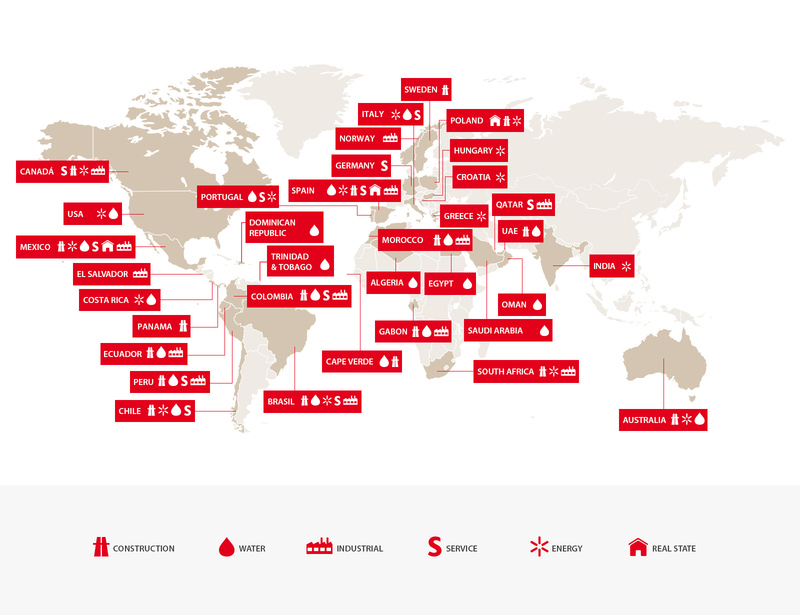 ACCIONA, spread across 65 countries in all five continents, has strengthened its international presence in 2014. Proof of this are the major contracts awarded, most notably the Sydney Light Rail in Australia, the biggest railway project in Norway (Follo Line Project), a photovoltaic plant in Sishen, South Africa, or AW3000 wind turbine orders for 915 MW in countries like Brazil and Mexico, among others. 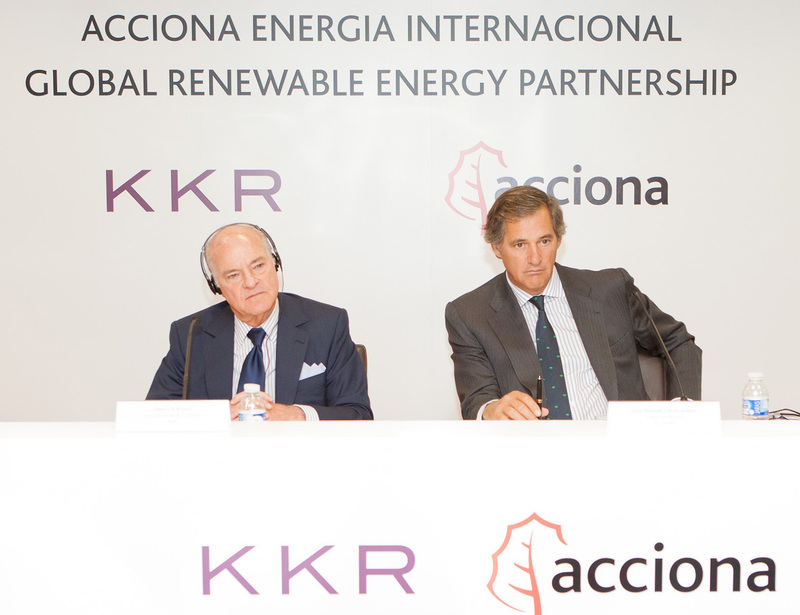 ACCIONA Energy signs strategic alliance with KKR and closes 2014 with 8,502 owned MW in 15 countries on the five continents and 123 additional MW under construction. 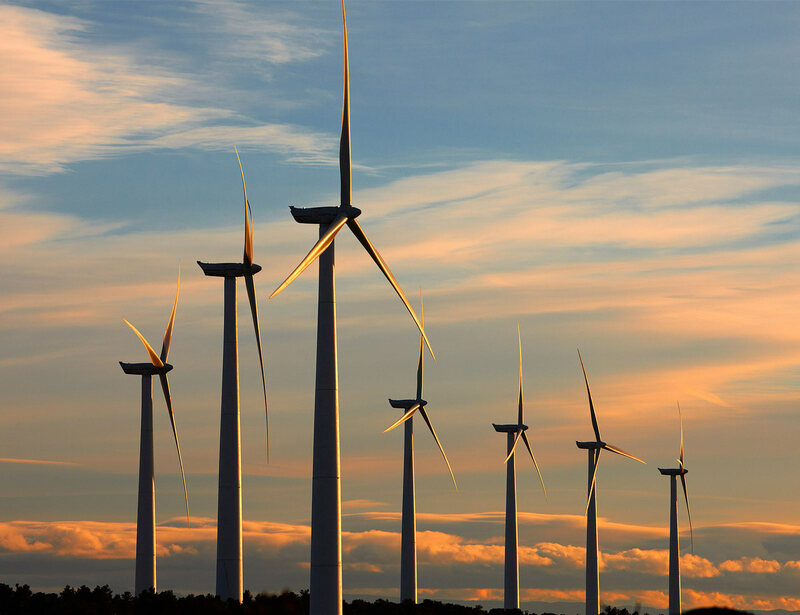 The division reinforced its wind turbine sales and EPC contracts for external clients and registered a turnover of 2.2 billion euros in 2014 -11.6% more than in 2013- due to the strong contribution of ACCIONA Windpower. 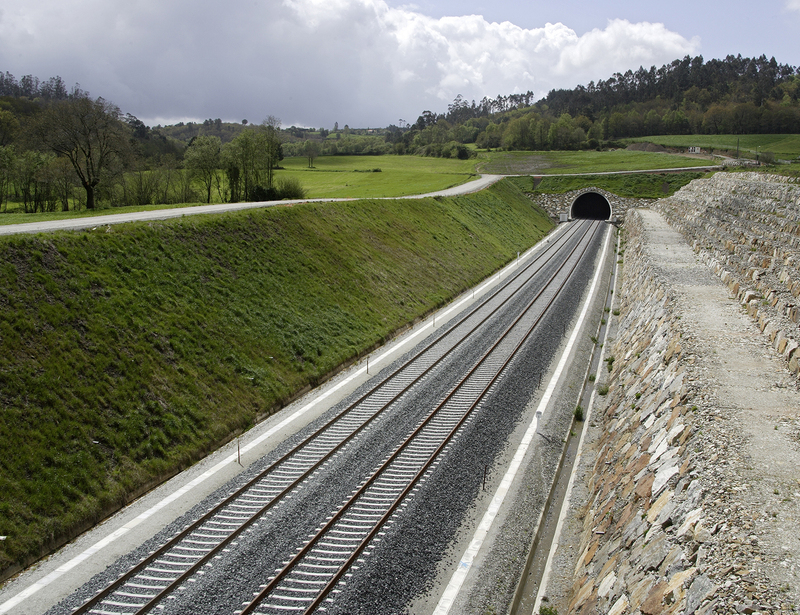 The new ACCIONA Infrastructure division was created in 2014 to adapt the infrastructure business to the market situation, with the ongoing objective of profitably and sustainably driving business growth. This new division, based on maximum specialisation in value-added business lines, encompasses all of the construction, concessions, water, industrial and services areas. With more than 100 years of experience, it covers all the stages of the value chain, from designing and engineering to the implementation of any kind of construction works, sometimes including all future maintenance. The Construction Area comprises three business units specialised in civil engineering and also includes the concessions area. Comprised of Civil Engineering, Industrial Engineering and Facility Construction areas, it covers the designing, supervision, supplying, construction, operation and maintenance of large power plants capable of generating, distributing and transmitting energy, both conventional and renewable; transport and management of Oil&Gas, as well as providing services for mining and industry. The combination to maximise synergies counts on 550 employees to undertake any national and international project. 2014 was a very satisfactory year as a result of the company's commitment to internationalisation. Operating on the five continents, ACCIONA Agua, is a leading water manager, offering global solutions. As a leader in its sector, ACCIONA Agua has demonstrated time and again its considerable end-to-end water cycle management capabilities, from capture through potabilisation and treatment up to its return to the environment. As a leader in the services sector, provides a broad offer of end-to-end solutions to its clients. 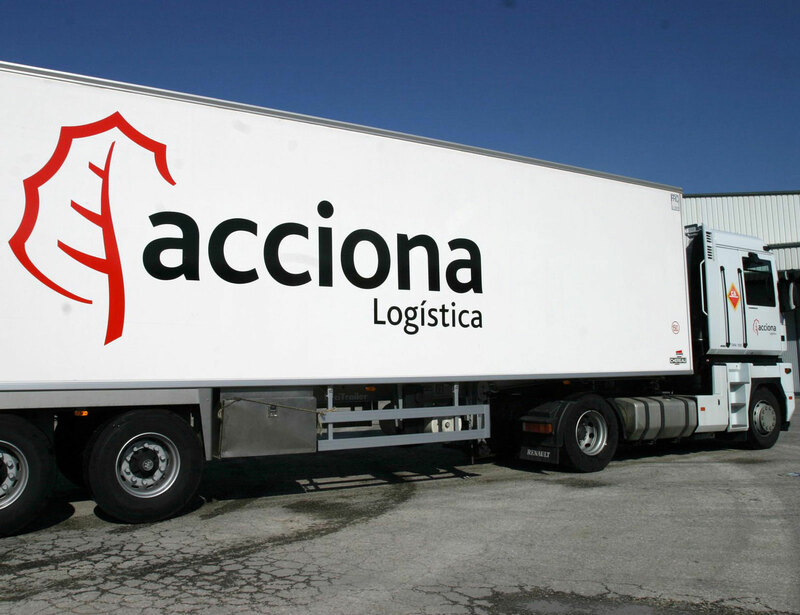 With more than 50 years of experience and a profound understanding of both the business and its clients' needs, ACCIONA Service is able to adapt its offering and provide custom services. 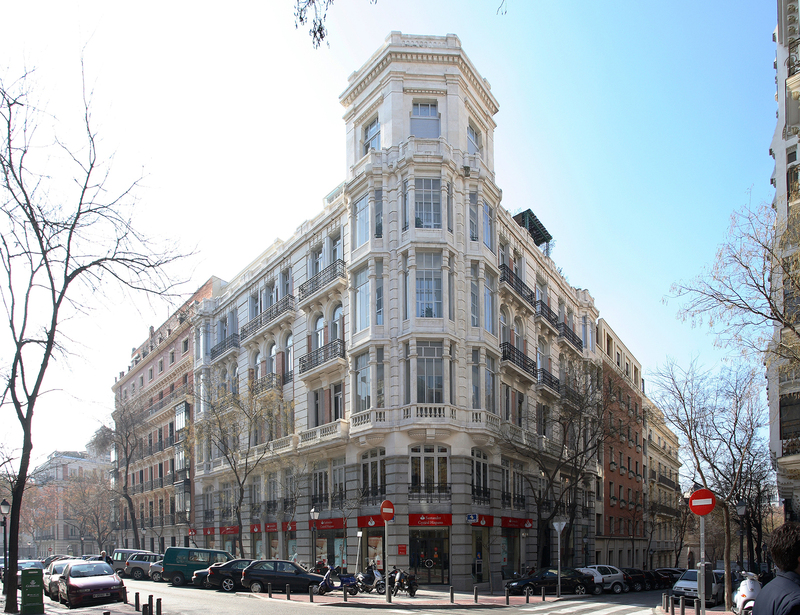 In a market showing signs of an optimistic reversal in Spain, ACCIONA Real Estate strengthens its competitive position, recovering a positive EBITDA. 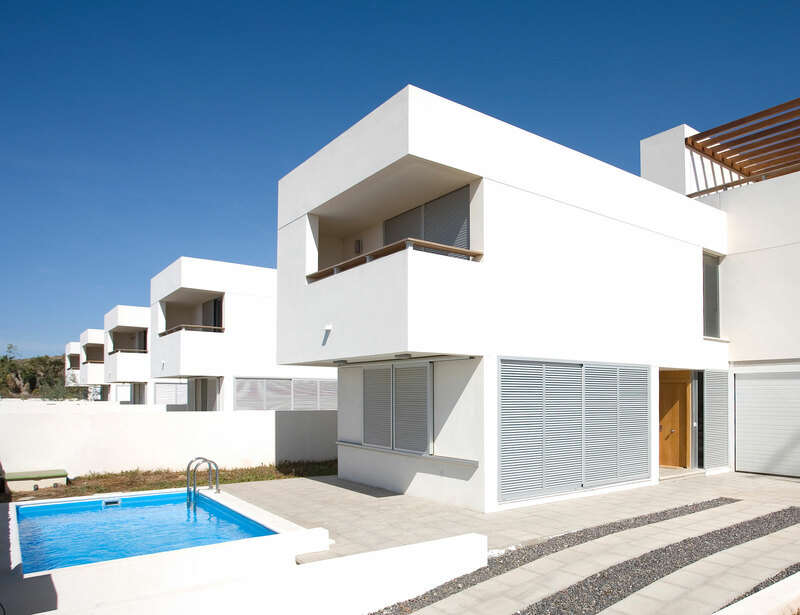 The residential property business in Mexico, conducted through subsidiary Inmobiliaria Parque Reforma, is performing well in the international market. On the premise of new routes and new challenges in 2014, Transmediterranea reinforced its fleet and consolidated its most profitable lines. Besides, it is actively involved in various R&D projects aiming at an improvement in efficiency, and in diverse social and cultural initiatives in the communities in which it operates. In 2014, with an increase in equity and a 20% growth in revenues, the profit before tax of this subsidiary has improved by 44%. Bestinver is focused on the search for returns by investing in undervalued companies based on its own fundamental analysis, appropriate risk management and a long-term vision shared by managers and investors. 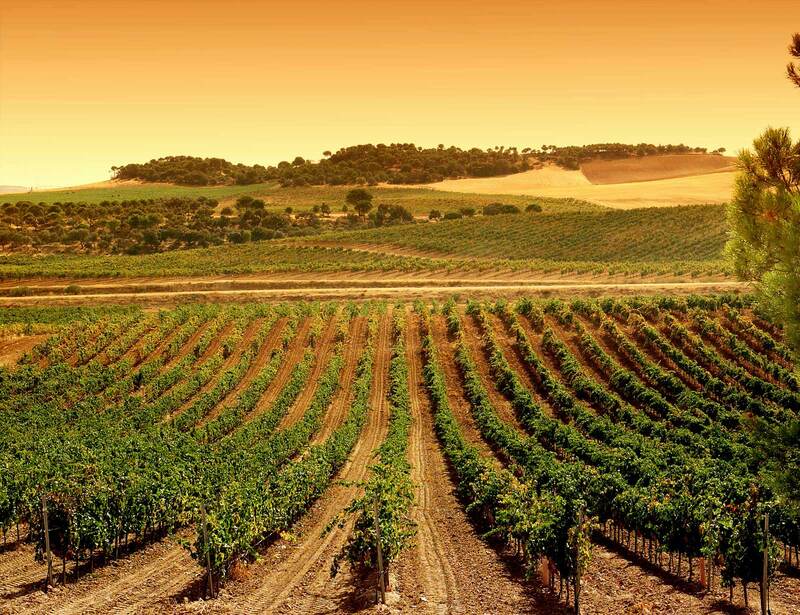 The wine group has seen an increase of 4.5% in turnover figures during the financial year 2014. With 40% of the revenue coming from foreign markets, the company remains steady in spite of the current juncture in domestic markets. 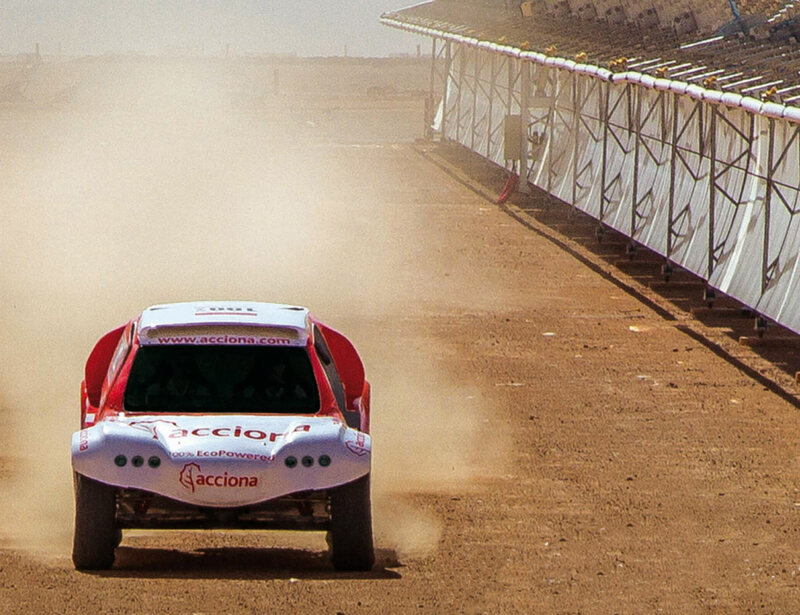 ACCIONA's effort in constant innovation continues to be remarkable. In 2014 we participated in 225 projects, therefore rising its innovation investment to 174.9 million euros, the highest to date (see details clicking on Information button). 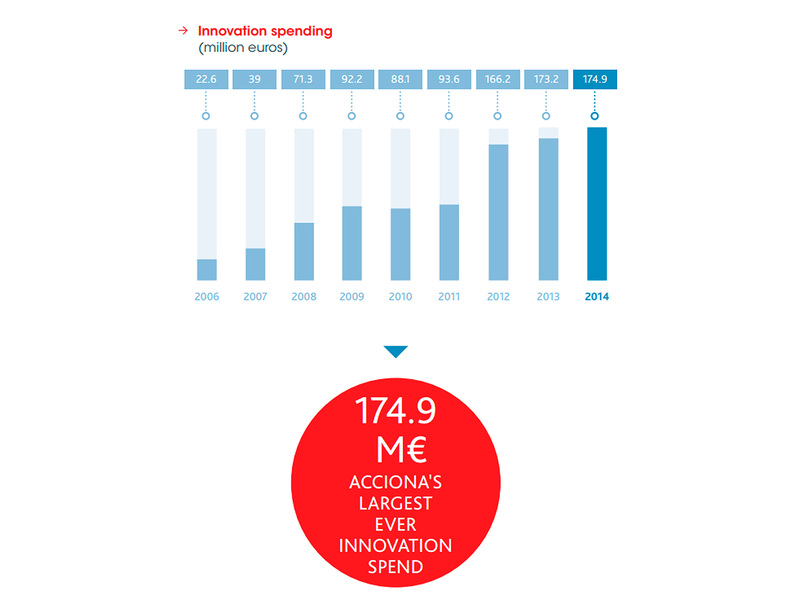 In addition, ACCIONA has worked on more than 23% of innovation projects outside Spain, reinforcing its strong commitment to internationalization.